A number of people face Kidney Stone problem. A number of theories are there about creation of these stones (crystals) in our kidney, which causes pain while urinating. The patients of this disease are increasing day by day. A number of treatments are available for Kidney Stones Removal. If the size of stones are small then some medicines and dietary changes are recommended to dissolve the stones, but if the stones are larger then surgery is recommended. However now the surgery has become painless, as it can be done without any incision, but still most of the people try to remove kidney stones without surgery. There are some home remedies and natural treatments are are used by some patients, however doctors don't recommend them as they don't have any scientific evidence to support such treatments. A number of people get benefited through such treatments. Such treatments are also known as Alternative Medicines or Alternative Therapies. 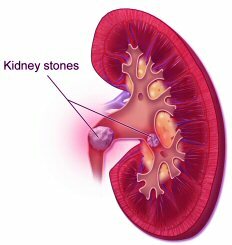 Why do people go for Home Remedies and Natural Treatment of Kidney Stones ? Alternative Medicines/Therapies, Home Remedies and Natural Treatments are all same things. People believe them because they came to know about it through word of mouth, and word of mouth is believed quickly than an advertisement on Television. Same is with Kidney Stones Removal. Kidney Stones have become a common disease now and so is the treatment. We are not saying that these therapies don't work. They work but not on everybody. People want to get treated for Kidney Stones naturally, because they know that Allopathic medicines have side effects connected with them while natural treatments and home remedies are side-effect free. Here we are going to tell you about some common home remedies and natural treatment used for Kidney Stones Removal across the world. Lemon Juice and Olive Oil: Mix 4 oz of organic olive oil with organic lemon juice (2-2 oz of each). Drink it and then drink 12 ounce glass of purified water. Repeat the process several times a day. Warning: Lemon is acidic in nature and it may damage tooth enamel and cause heartburn and ulcer. Apple Cider Vinegar: Add 1/2 lemon and 1 tablespoon Apple Cider Vinegar in 12 oz of purified water. Drink this solution in one go. Repeat it 3 to 4 times per day till the symptoms improve. Warning: Apple Cider Vinegar is rich in citric acid and it can cause the same side effects as the previous remedy. It is more dangerous for patients having BP or Diabetes medication. Coke and Asparagus: Aspagarus is diuretic (that makes an urge to pass out urine) and Coke contains phosphoric acid which can help in dissolving kidney stones. Warning: Some researches have found that it can worsen the condition. Lab Grade Chanca Piedra: It is a weed also known by a common name "Stone Breaker". Its name is based upon its traditional usage in breaking kidney stones. It is also available in form of capsules. I tried to find its reviews on Webmd and found that most of the patients are benefited by its usage. Beer: Some people drink more beer as a home remedy to dissolve kidney stones. Fruits and Herbs: Some fruits and herbs are known for better effect on Kidney stones such as Watermelon, Pomegranate, Basil and Wheatgrass. Basil Tea: Basil is an important herb according to Ayurveda. Just chewing 2-3 leaves of basil on daily basis can a person healthy. Basil Tea is considered as a remedy for Kidney stones. Just boil 5-6 basil leaves in water for 10 minutes and then add some honey in it ! Your basil tea is ready. Note: None of these treatments are used by us and we don't bear any type of responsibility of these treatments. So its better to research more before starting any of these treatments.